Knee osteoarthritis is a progressive and debilitating condition with enormous impact on health care spending. More than 25 million North Americans are currently affected by it (ref1), and nearly half of all people will develop knee osteoarthritis symptoms by the age of 85 (ref2). What is it, what are the risks, and what does the latest research say about treatment options? 2 What are the risk factors for developing knee osteoarthritis? 2.2 Is physical activity a risk factor for developing knee osteoarthritis? 3 How is knee osteoarthritis treated? 4 But I have knee osteoarthritis – how can I exercise? 5 But what if I am overweight – should I still exercise? Osteoarthritis, the most common form of arthritis, is a progressive disease characterized by the loss of joint cartilage and the degradation of the bones protected by it. This disease process often results in inflammation, excess joint fluid accumulation, bony growths, and muscle and tendon weakness. Osteoarthritis occurs most frequently in the knee. The age of onset and symptoms of knee osteoarthritis can vary, but progression is usually associated with progressively worsening joint pain, stiffness, leg muscle weakness and decreased joint range of motion. Meniscal tears are also quite common in osteoarthritic knees, and as an aside, these tears are often treated unnecessarily with arthroscopic surgery (research suggests no difference in functional outcome when arthroscopic surgery is added to standardized physiotherapy for patients with meniscal tears and knee osteoarthritis). The symptoms of knee osteoarthritis can make it difficult to perform activities of daily living, such as walking, squatting or using the stairs. Progression of osteoarthritis can lead to further restrictions in daily activities, reduced work productivity, diminished quality of life, and the necessity of total knee replacement surgery (ref3). What are the risk factors for developing knee osteoarthritis? The number one modifiable risk factor for the development and progression of knee osteoarthritis is body weight. Multiple studies have shown that being overweight quadruples the risk of developing knee osteoarthritis, and that even a small amount of weight loss can lead to significant improvements in patient reported pain and function (ref6, ref7). Is physical activity a risk factor for developing knee osteoarthritis? I am frequently asked by patients if activities such as team sports, skiing, running, and general overuse of the joint, can cause knee osteoarthritis. Under most circumstances the answer is no. There are some studies that suggest heavy joint overuse can increase the risk of developing osteoarthritis, in particular for athletes who place exceptional demands on their anatomy, such as elite long distance runners (ref5). However, the greater body of evidence suggests that for the majority of recreational athletes, physical activity may actually protect against knee osteoarthritis, even regular long-distance running (see “Does Running Cause Knee Osteoarthritis? Or Protect Against it?”). In fact, as stated above, people who are physically inactive have been shown to be statistically more likely to develop knee osteoarthritis than their more active peers. Sports and other physical activities significantly increases the risk of traumatic injury to the knee, which is a known risk factor for knee osteoarthritis. Physical activity in people who are overweight can place excessive levels of stress on knee joints, beyond what they were designed for. Physiotherapy is among the dominant approaches recommended for the conservative treatment of knee osteoarthritis. It can be used to manage the symptoms and combat disease progression (ref 8, ref9, ref10). Physiotherapy usually consists of exercises and manual therapy designed to maintain mobility, improve joint lubrication, improve strength, restore muscle balance and improve tolerance for physical activity (ref 8). Pain killers or glucosamine and chondroitin nutritional supplements are often prescribed for pain relief (ref3). Pharmacological and nutritional supplements are used to reduce joint pain and swelling, but they are unable to prevent ongoing joint damage or slow the progression of the disease. These interventions can also not address the underlying risk factors for the development and progression of osteoarthritis, in particular, excess body weight. Injections of hyaluronic acid or hyaline analogs, such as hylan G-F 20 (commercially known as Synvisc®), show promise as a supplementary therapy for temporarily restoring joint fluid properties, and possibly also reducing inflammation. These injections temporarily relieve pain and improve function (ref11, ref12). Steroid injections are sometimes also used as a treatment, but the latest research suggests that this may be mostly, or entirely, ineffective (ref13). Physical rehabilitation programs can be used to strengthen the muscles surrounding the joint, thereby relieving joint wear, and slowing progression of the disease. Exercise therapy can also directly address underlying risk factors including muscle imbalances and excess body weight. A variety of studies support the use of exercise as therapy and prevention. 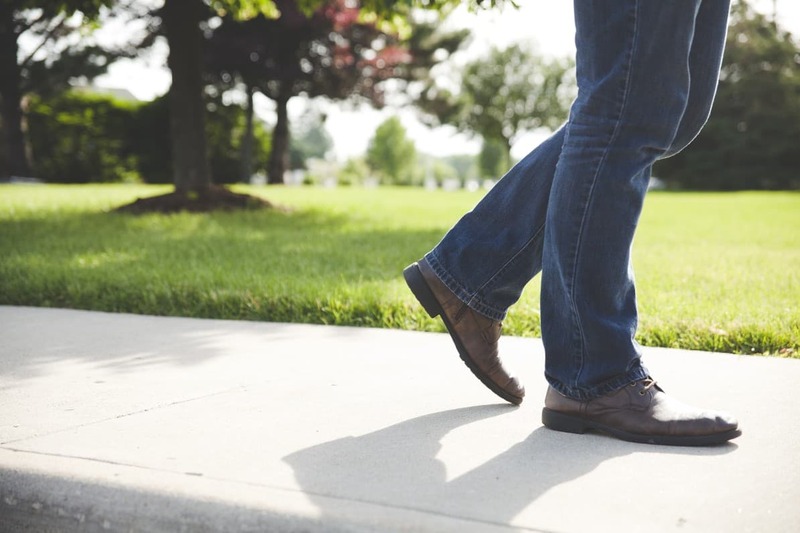 For example, weight-bearing exercise in the form of a daily walking regimen was shown to be effective in managing joint symptoms, reducing reliance on medication and increasing patient reported quality of life and functional capacity (ref14). In older adults with knee osteoarthritis, moderate physical activity at least three times per week has been shown to decrease the risk knee disability by 47% (ref15). But I have knee osteoarthritis – how can I exercise? If you are concerned about how you can safely and comfortably begin exercising, supervised exercise therapy may be a good option for you. A physiotherapist can help you identify weak muscles that can be strengthened, create a personalized and targeted exercise therapy program that you can do on your own, teach you to do it within safe boundaries, and help you progress it. Lower body positive pressure treadmills such as our own AlterG Anti-Gravity treadmill, are an emerging technology that can offer unique benefits to sufferers of osteoarthritis. In particular for those with more advanced disease, those who are overweight (see below), or those who wish to exercise at a more advanced level than their knee osteoarthritis will otherwise allow. For more information, please see our post: “A Novel Treatment for Knee Osteoarthritis: the AlterG Anti-Gravity Treadmill”. But what if I am overweight – should I still exercise? Excess body weight is a significant risk factor for osteoarthritis of the knee because it places extra demands on the knee which may exacerbate symptoms. If you consider that a force of up to six times an individual’s body weight is exerted across a knee joint with every step, it is evident that an overweight individual with knee osteoarthritis is at a significant risk for exacerbated joint symptoms and more rapid disease progression (ref16). So should overweight individuals exercise, or is this counterproductive? In general overweight individuals with knee osteoarthritis should exercise – to both strengthen the knee and to help achieve a healthier bodyweight. This will, in turn, reduce the forces that are exerted across the knee, decrease the risk of disease progression, and potentially reduce the symptoms that the individual experiences. But given the extra risk of further knee damage in this population, overweight individuals should seek out the advice of a physiotherapist or other knowledgeable health care provider to help them establish a safe and regular exercise program, such as a walking routine. In addition, overweight individuals should seek out the advice of a Registered Dietitian to help establish and work towards realistic weight loss goals. The importance of weight loss cannot be overstated. For example, one study concluded that reducing body weight in women by 11 pounds could cut the risk of knee osteoarthritis by half (ref 17). Use of novel body-weight supported exercise modalities can also be uniquely beneficial for this population. For more information, please see our post: “A Novel Treatment for Knee Osteoarthritis: the AlterG Anti-Gravity Treadmill”. This article was a collaboration between Lindsay Scott, PT and Ryan Davey, PhD. Arden N., Nevitt M.C. Osteoarthritis: epidemiology.Best Pract Res Clin Rheumatol. 2006;20(1):3–25. Murphy L., Schwartz T.A., Helmick C.G., et al. Lifetime risk of symptomatic knee osteoarthritis. Arthritis Rheum. 2008;59(9):1207–1213. Shih M., Hootman J.M., Kruger J., et al. Physical activity in men and women with arthritis National Health Interview Survey, 2002. Am J Prev Med. 2006;30(5):385–393. Chakravarty E., Huber H., Lingala V. et al. Long distance running and knee osteoarthritis a prospective study. Am J Prev Med. 2008:35133-8. Ackerman I.N., Osborne R.H. Obesity and increased burden of hip and knee joint disease in Australia: results from a national survey.BMC Musculoskelet Disord. 2012;13:254. Barbour K.E., Helmick C.G., Theis K.A., et al. Prevalence of Doctor-Diagnosed Arthritis and Arthritis-Attributable Activity Limitation — United States, 2010–2012. Morb Mortal Wkly Rep. 2013;62(44):869-873. Fransen M., Crosbie J., Edmonds J. Physical therapy is effective for patients with osteoarthritis of the knee: a randomized controlled clinical trial. J Rheumatol. 2001;28:156-64. Page C.J., Hinman R.S., Bennell K.L. Physiotherapy management of knee osteoarthritis. Int J Rheum Dis. 2011 May;14(2):145-51. Fransen M., McConnell S., Harmer A.R., et al. Exercise for osteoarthritis of the knee. Cochrane Database Syst Rev. 2015 Jan9. Petrella R.J., Wakeford C., Pain relief and improved physical function in knee osteoarthritis patients receiving ongoing hylan G-F 20, a high-molecular-weight hyaluronan, versus other treatment options: data from a large real-world longitudinal cohort in Canada. Drug Des Devel Ther. 2015 Oct15;9:5633-40. Richett P., Chevailer X., Ea H.K., et al. Hyaluronan for knee osteoarthritis: an updated meta-analysis of trials with low risk of bias. RMD Open. 2015 May 14;1(1). Juni P., Hari R., Rutjes A.W., et al. Intra-articular corticosteroid for knee osteoarthritis. Cochrane Database Syst Rev. 2015 Oct22;10. Evcik D., Sonel B. Effectiveness of a home-based exercise therapy and walking program on osteoarthritis of the knee.Rheumatol Int. 2002;22(3):103–106. Penninx B.W., Messier S.P., Rejeski W.J., et al. Physical exercise and the prevention of disability in activities of daily living in older persons with osteoarthritis. Arch Intern Med. 2001;161(19):2309–2316. Takacs J, Anderson JE, Leiter JRS, MacDonald PB, Peeler JD. 2013. Lower body Positive Pressure: An Emerging Technology in the Battle Against Knee Osteoarthritis? Clinical Interventions in Aging. 8: 983-991. Felson D.T., Zhang Y. An update on the epidemiology of knee and hip osteoarthritis with a view to prevention. Arthritis Rheum. 1998;41(8):1343–1355.